Did you know that I super love all things Charlie Brown? We grew up on Charlie Brown and we loved watching all the Charlie Brown movies! My mom has helped me carry on the same tradition with my kids and has purchased almost every Charlie Brown cartoon available so that they too can watch. One of my favorite Charlie Brown Movies is A Charlie Brown Thanksgiving. It seriously cracks me up every single time I see the Thanksgiving dinner they put together of popcorn, pretzels, jelly beans and toast. I could totally see my kids making a meal just like that on their own! Haha! And I have so many memories of sorting through my Halloween candy while we watched It’s the Great Pumpkin, Charlie Brown. We did that every single Halloween when I was a little girl. Oh, and I always tease Max that he is my Linus. I have tons of pictures of him as a toddler with his blue blanket. He still has that same blanket even though he’s outgrown his need to have in with him all the time. One of the lesser known Charlie Brown movies is I Want a Dog for Christmas, Charlie Brown. It is so funny! Every single time I run errands with my kids, I think of Rerun and B of the B day (back of the bike day). It’s so funny how he describes a kid’s perspective of running errands with their mother. It is spot on! Given my love for all things Charlie Brown, I was really excited to be a part of this campaign! The Peanuts movie comes out on Friday, November 6th in theaters and Albertsons has partnered with them and has a really fun promotion going on. If you buy 3 participating products, you can get an exclusive Peanuts Trick or Treat bag for free! You can also use it as a reusable shopping bag, but of course my kids want it as a trick or treat bag. And I can’t say I blame them! Aren’t they cute? One of the products included in the promotion is all things Pop Secret. 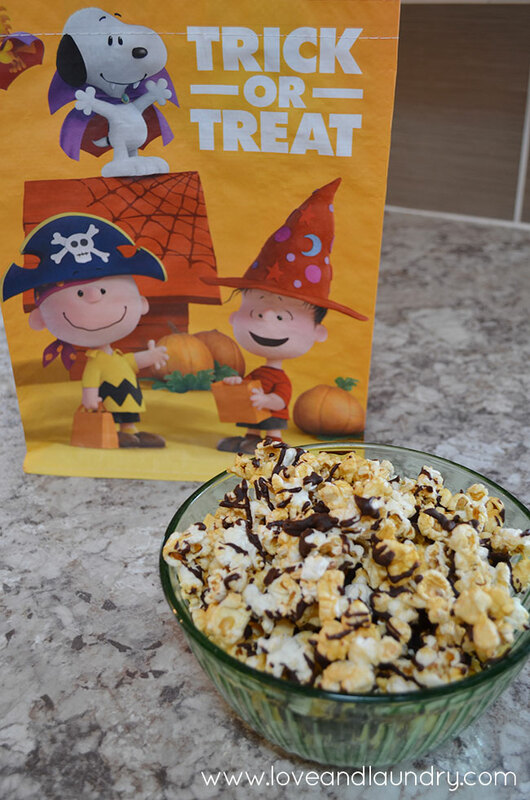 And since popcorn really reminds me of how much I love A Charlie Brown Thanksgiving, I wanted to show you a fun and super simple popcorn treat. I love mixed popcorn treats, but I hate all the work in making them. 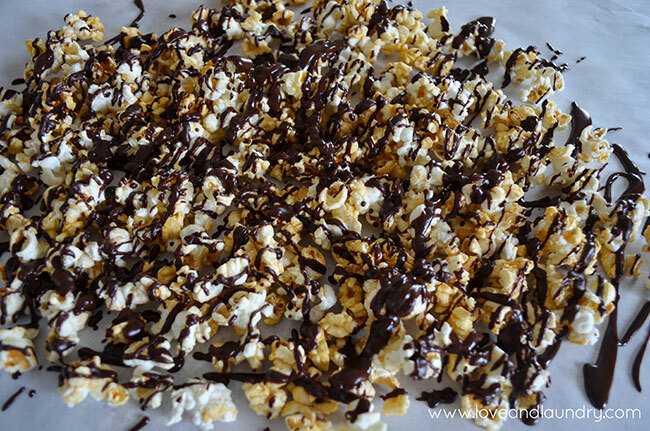 This is kind of a cheater way to make chocolate covered caramel popcorn. Let’s call it semi-homemade. It’s simple – only a few minutes to make – and it is absolutely delicious! First, start with a bag of popped Carmel Pop Secret. Spread it out on some parchment paper. (I’ll give you a tip. The instructions on the bag said to pop for 1 1/2 minutes, but it took almost 2 1/2 minutes in my microwave. 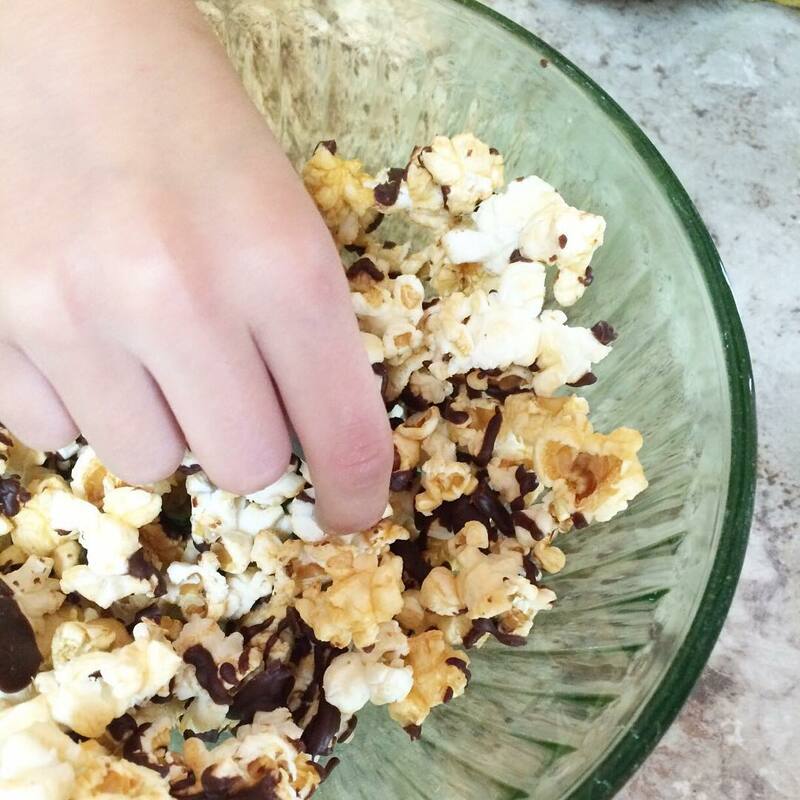 Microwaves are all definitely a bit different, so watch for the popcorn to slow popping rather than just using the instructions). Then, take 1/2 cup chocolate chips and 2 tablespoons of butter and melt them in the microwave. I start with a minute and then stir it in 30 second intervals until it’s all melted. The butter makes the chocolate more drizzly. It’s really yummy! 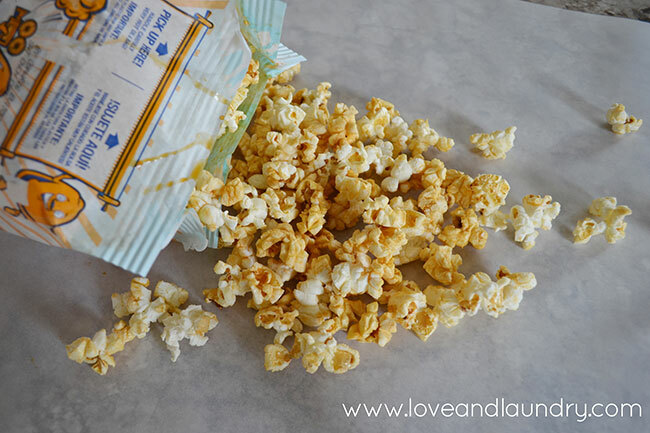 What I love about doing popcorn like this is that it is not overly sticky like homemade caramel popcorn can get. 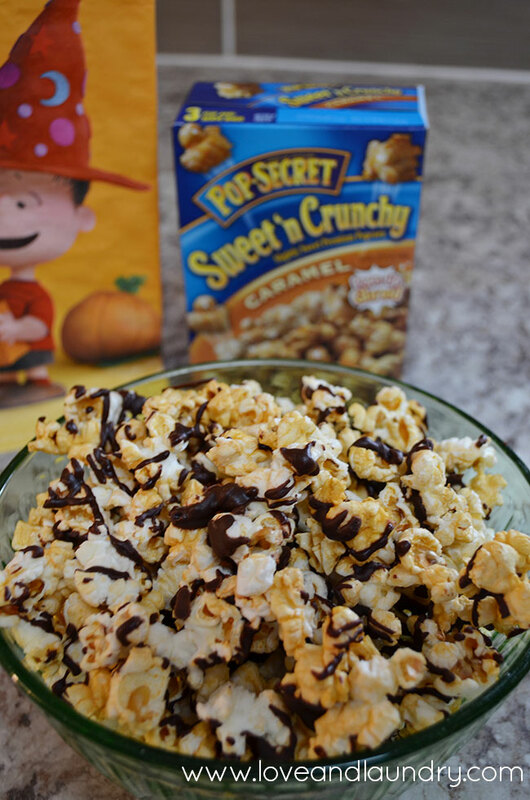 Pop Secret caramel popcorn has a texture that is more like kettle corn but with the caramel flavor, if that makes sense. It is delicious! After you get all of the chocolate drizzled and you want the chocolate to set up faster, pop it in the fridge for a bit. Then you can avoid really sticky fingers when you eat it! Haha! I surprised my kids after school the other day with a bowl of this stuff and it was gone in a split second. And since it only took me a few minutes to make, so I’m adding it to my usual after school snack rotation. Easy for me and I get to be supermom in their eyes. Win for everyone!